I heard that some people turn away from my tomatoes with cracks at the top or what is considered not ripe or discoloured. I'm shocked by this. 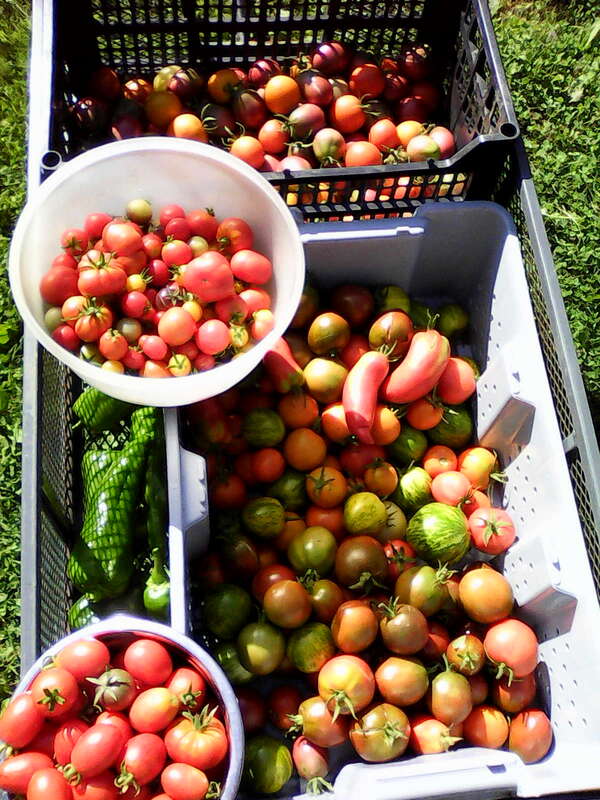 The tomatoes I grow are field grown heirloom tomatoes and I follow with a quote from the Cottage Gardeners Heirloom Seedhouse website, from were I buy the bulk of my seeds. "All our seeds are non-gmo, non-hybrid, non-patented, untreated and open-pollinated. They include rare & endangered heirloom varieties that have been loved and saved for generations and newer varieties developed specifically for organic agriculture." For much more information on each type of seed and tomato you can check out their lovely website. Amethyst Cream Cherry – the best cherry tomato I have ever grown. There’s no mistaking it’s beautiful burgundy shoulders and cream coloured bottom. Then there’s the taste – oh my, the taste – nothing compares. Blanche du Quebec – a Canadian Heirloom which name speaks for itself. The medium fruit is white to pale yellow and has a wonderful sweet flavour. Black Plum and Black Prince – the ones which add so much colour to sauces. They are heirloom tomatoes and are not so much disease resistant but the flavour is worth every bit of cracked top you may have to take off to get to the real good stuff. Try them and you’ll understand exactly what I mean. Crimean Rose and Black Cherry – I get these two mixed up when I’m picking, they resemble each other. They are good sized cherry tomatoes with lovely dark tops and rose-coloured bottoms. Both have great flavours. Gilbertie Paste – my most favourite paste tomato. They are long like a pepper with a little point at the end. I like them because they slice nice and evenly so are great for the dehydrator, which makes for wonderful tomatoeyness mid-winter on pizzas, etc. The cut off ends go into anything I might be making at the time. Green Zebra – How can a tomato taste so different than any other tomato? I call it citrus-like. Aside form the absolutely brilliant, flashy yellow and green stripes, these tomatoes add quite a statement to any dish whether it be a tray of slices or a salsa. I always chop some to add to my quacamole. Jaune Flamme Cherry – I’ve been saving seeds for this cherry for years because it keeps popping up voluntarily in the greenhouse. I let a few plants grow so we can enjoy their bounty after the field ones are gone and to save the seeds. They are so delicate that some split from the time I pick them in the field to when I get them into the house. They should have a little teeny label on them saying “Handle with great care” or “Eat immediately” which of course I very often do. Martino’s Roma and San Marzano –the paste tomatoes used for most sauces. I vote these the “Most Considerate Tomatoes” of all. They are not bothered by bugs or weather. When I approach the plant to pick I can almost hear it saying “Ok, here she is, all tomatoes that are ripe drop gently to the ground to make it easier for her.” The tomatoes have the decency even to stay on the ground if they’ve fallen when they’re not quite ripe enough and say “You don’t want us yet? No problem, we’ll just lay here and ripen up in the sun until you come back in a day or two.” And they do and are still perfectly firm. Matt’s Wild Cherry – small red cherry tomatoes from seeds I’ve been saving for years – great in the Mix. Tangerine Orange – I must have purchased the seeds for these a few years ago and have been saving them since then. They are the favourite smallish tomato of everyone who works here. Not only is the flavour as sweet as candy, the smell when you’re slicing it is enough to make your mouth water. Thorburn’s Terra Cotta – This one is the brown/clay coloured tomato in the mix. Apparently, the seeds were introduced in 1893, disappeared in 1921 and re-appeared in 1993! If not for its wonderful taste, why not for its unusual colour, name and history. I love growing them for this reason. Yellow Pear – again a name speaking for itself. These are just fun to grow, to have in a mix and to eat. These are most of the varieties I love to grow from year to year. 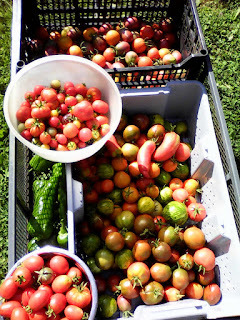 I grow mostly paste tomatoes for my sauces but find it hard to resist the colours and flavours of the other heirlooms. I save several of my own seeds from year to year and would be happy to trade with you if you have some unusual varieties. Let me know. Is the word, is the word, is the word . . . With so much sunshine, the weeds grow quite quickly and flower so there is a bee on almost every plant on our property. I have been stung five times in the last week. On Monday while moving water hoses around I changed from my flip flops to boots so I’d be less likely to get stung. Nope, a bumble bee got caught in between my shin and my boot – OUCH! Luckily for me I was at Dr. Shawn Yakimovich’s talk at the Backyard Apothecary Saturday and learned to grab a leaf or two of plantain (which happens to grow on every square foot of our property), rub it to create a “juice”, then apply it to the stung area. I did this right away. The sting stopped in a minute and I applied Dapis gel when I got back to the house. It hurt again yesterday so I took some echinacea to combat any infection the bee might have left with me, then put some calendula ointment on it last night. I think I got it right because the rash stopped getting larger and it doesn’t hurt anymore. Tomatoes are changing colour rapidly so I have many for you this week. I’m getting about 2 or 3 cukes a day now. It’s a very good year for eggplant. I’m still eager to try some eggplant recipes but have been a tad busy with all the other veggies. The sweet peppers are large and green and are also available for you. Garlic is ready although I need to move it into the basement as it’s too humid in the garage to cure properly. Some green cabbages are large enough to grace your table. The red cabbage is taking a little longer. Zucchini plants are producing like crazy. I can hardly pick them fast enough before the fruits become huge and I’m talking about hours between normal size and Z.O.U.S. (Zucchini of Unusual Size). And it turns out I have more spaghetti squash plants than I realized – oh my. Watermelons are doing well – can you believe it - and we should get musk melons in a few weeks. Two other squash plants were entirely done in by the notorious squash vine borer – ugh. There are some lovely green acorn squash and pumpkins growing. The basil just keeps growing and doing its wonderful smell thing. I find myself spending as much time in the kitchen these hot afternoons as I spend in the gardens in the cool mornings. I think of salsa while picking tomatoes, tzatziki while picking cukes, hummus while trimming the curing garlic, slaw while picking cabbages, veggie tray for all of the above – you get the picture. I made about 20 jars of salsa this long weekend and dehydrated zucchini, cucumber and eggplant slices. I made tzatziki and hummus today and will make fresh salsa tomorrow. There’s definitely some zucchini baked goods in the foreseeable future. As promised I started microgreens for you.